The Peppermint Patty flavored coffee is perfect for those that like the cool, minty aroma and refreshing taste of peppermint. With a hint of rich chocolate swirled into this peppermint delight, the Peppermint Patty flavored coffee will show your taste buds the quality of delicious 100% authentic Arabica beans. You can start the morning with a burst of peppermint perfection or end the evening with this Peppermint Patty sweetness, but regardless of when you want to indulge in this flavored creation, the flavor will be divine. A heat-sealed valve bag will ensure the freshest coffee possible � which is why we roast and ship our Peppermint Patty coffee on the same day. 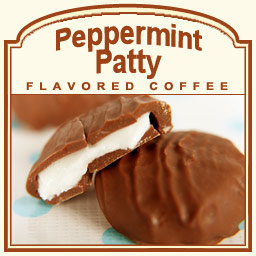 With only 2 calories in each cup, you can indulge in this minty-chocolate Peppermint Patty flavored coffee over and over again. Let your senses give into this exceptional pairing of flavors!